Evidence implicating John Andrews, Esq. GENTLEMEN:—I this day received a summons at 12 o'clock, requesting my attendance at 11 o'clock this day, at the Court House in Newport, in order to give evidence before your honors to that knowledge I have relating to the burning and destroying his Majesty's schooner called the Gaspee, and to the assembling, arming, training and leading the people concerned therein. I should have cheerfully obeyed said summons had my health permitted, but I have been confined for a week past with a swelling in my hand, which hath rendered me unable to stir out of doors; but as soon as I am able, I shall wait upon your honors, and inform you all I know relating to that matter, which your honors will judge just nothing at all to the purpose. The examination of John Andrews, Esq., of Cranston, is the colony of Rhode Island, taken on oath at Newport, in said colony, on the 5th day of June, 1773: Who declares and says, that he was in the town of Providence the night that the schooner Gaspee was destroyed, at a tavern where he spent the evening with a number of gentlemen; and after supper he heard a drum beat in the street, and inquired into the cause thereof, and received for answer, that it had been training day, and the people were breaking up their frolic; about 12 o'clock he repaired to his lodgings, it being very dark, and went to bed; the next morning, the sun about half an hour high, was surprised with hearing some persons say to each other that the said schooner was burnt, upon which, he opened the window and saw on the other side of the street two black fellows and one white man talking together; I inquired what was the matter, and received for an answer from the white man, that some people in the night had burned the man-of-war schooner; upon which, he immediately dressed himself, and waited upon the deputy governor; and he informed him that he had heard the news, and sent for his horse, in order to repair to the spot and enquire of Capt. Dudingston and his people, and find, if possible, the persons that had done the mischief; we procured a horse as soon as possible, and went to Pawtuxet where we found Mr. Dudingston badly wounded, and we saw the said schooner on shore about a mile and a half distance, which appeared by the smoke to be on fire, and burnt down almost to the water's edge. The deputy governor, in his hearing, inquired of Mr. Dudingston, if he had any knowledge of the persons that committed this trespass; he made answer that he should render no account about the matter until he appeared before a court martial, where he expected to be tried, if he survived his wounds, and such account might be made use of to his advantage, but was willing that his people should be sworn, and had them called in, and cautioned them to swear the truth; he then, as his Majesty's Commissary for the colony, conferred with Mr. Dudingston concerning saving such guns and stores as could be saved, and agreed to save all that was possible to be saved, and procured a man to undertake the business; and he likewise requested that his people might be taken care of, and sent on board his Majesty's sloop of war called the Beaver, then at Newport, and procured a small vessel to carry them on purpose; he visited Mr. Dudingston several times, and requested of him if he had any knowledge of such persons as had done the mischief that he would inform him thereof, that the persons might be brought to condign punishment, but he always declined saying any thing in the affair. And further, that early in the morning after the said schooner was destroyed, he met with Daniel Jenckes, Esq., Chief Justice of the Common Pleas, in the county of Providence, who said that he had informed the deputy governor of what had happened the preceding night respecting the Gaspee, and then urged that the deputy governor and this examinate would repair immediately to Pawtuxet, and examine such of the Gaspee's men as could be found, while it was fresh in their memories, that the villains might be discovered and not the whole colony blamed. It is worth noting that although Briggs singled out John and Joseph Brown, Potter, and Richmond as attackers, Montagu was seeking the interrogation of Andrews, Fenner, Cole, Hitchcock, and Sabin as well. Apparently the admiral's own inquiry was still proceeding and widening as the official inquiry progressed. Andrews' earlier meeting with Justice Daniel Jenckes only points out the collaboration done to get their act together as soon as possible. Andrews' accompaniment of Lt. Gov. Darius Sessions to interview the wounded Lieutenant Dudingston the morning of the attack was deliberately done to assess what information Dudingston and his crew had on the attackers, and to plan the official Rhode Island response based on what evidence, or lack thereof, would be forthcoming from the British. It is too curious that John Andrews and his group of fellow barristers, Cole, Brown, and Hitchcock, denied any foreknowledge of the attack on the Gaspee, particularly when such a large meeting of angry men had gathered at the same inn that night to plan the Gaspee's destruction. We can only conclude that Andrews testimony was obviously false, and that his high standing within the judicial system made his false testimony all the more obstifrucating to the Commission of Inquiry. He stalled having to give testimony before the Commission in January. By June all four lawyers had time to collaborate and practice their false charade. We know very little about this man. The name is common, and the lineage extensive. Any suffix of Esq. therefore becomes very important in distinguishing a suspect known to have been a lawyer. We do find reference to a John Andrews, Esq. of Boston who attended a courts-martial on the HMS Somerset in Boston in January, 1775. In March of 1771, a John Andrews (no Esq. suffix) was selling his 150 acre farm in Cranston. There was a John Andrews, Esq., who was elected to represent Cranston in the Colonial Assembly in May of 1772. In May 1795 his estate notice was published by Nehemiah Knight, Esq. of Cranston, John R. Arnold, and Moses Arnold. In May 2011, Bill Cahill sent us this ad he found in the 04Nov1777 edition of the Providence Gazette. This ad gives valuable insight into this man we seek. 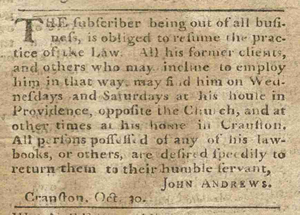 "The subscriber being out of all business.." undoubtedly refers to the fact that Judge of the Vice Admiralty Court was no longer a viable job title after the commencement of the American Revolution. But he was well known within Rhode Island legal circles, and had obviously given false testimony to the British court of inquisition into the Gaspee Affair, so perhaps he felt that resuming the private practice of law was a good option for himself. His law office "...house in Providence, opposite of the Church undoubtedly refers to King's Church, at the time Anglican but, of course, switched to Episcopal after the Revolution. Note that the "Church" is highly significant in our analysis, since it indicates that he was a rather haughty Anglican/Episcopalian, for there were other churches in Providence at the time, albeit many of them referred to as 'Meeting Houses' at the time. Because of this attitude we can venture that our John Andrews, Esq. was likely a rabid Episcopalian, if not Anglican. The notice above confirms our other assumption, in that John Andrews was of American, not British ties, for he stayed in Rhode Island after his service as Judge of the Vice Admiralty Court was terminated with the onset of hostilities. This is also consistent with the fact that Andrews owned extensive properties in both Providence and Cranston. Andrews John III A 1 listed on map a Jno Andrews. John Andrew's house/law office property was across North Main Street from King's Church and just down from the home of Dep. Gov. Darius Sessions (see map). The St. John's Episcopal Church is still at the site of 271 North Main Street, Providence, RI. From this site, we can ascertain that the former site of Andrew's house/law office has now been incorporated into the land of the Roger Williams National Memorial Park. We can assume that our John Andrews, Esq. was the one in Cranston/Providence and, per the Cranston Estate Notice, that he probably died in 1795. Our John Andrews is apparently NOT related to the Zephaniah Andrews. Too bad, because Zeph is listed as an appointed member of Providence's Committee of Inspection (on compliance with the boycott of British goods) as noted in History of Providence County, Rhode Island, by Richard M. Bayles, New York, 1891, page 181. There was a John Andrews, mariner whose property in Newport was in 1781 confiscated by the State in retaliation for his being a Tory. We only have one with dates, who would have been 56 years old at the time of the Gaspee attack, and old enough to have been appointed to a judgeship by that time. Furthermore, this person had lived and died in Providence, and was buried in the Old North Burial Ground, as were many Gaspee raiders. But since we also know that Grace Church, while now relocated, is an Episcopal Church, it is highly likely that the John Andrews we seek is one of the ones buried there. Since we now know that our John Andrews was from Cranston we can assess his household as consisting of himself, one male less than 16 yo, 3 females, and one servant, not a slave. John Andrews (1724-1805) whose first marriage in 1745 was to Abigail Whipple (1725-1751) in Providence, RI. He had two children with her before she died in 1751. This Abigail Whipple shared a common great-grandfather, John Whipple (1617) with Gaspee attack leader, Abraham Whipple. This John Andrews also would have been 48 years old, enough to have attained a judgeship at the time of the Gaspee attack. This John Andrews had a father, John Andrews (1692/3 -- __ ), and a son John Andrews (1756 -- __ ) who likely aren't our player since the father would have been very elderly (80) and the son (16) too young to have been a judge. While this John Andrews did die in 1795, given the customs of the day, it is a stretch to have him die so far from a home estate in Cranston where John Andrews lived. The distances between any Rhode Island town and Providence is not so great that people don't move around, but both John Andrews living in East Greenwich (about 12 miles South) and the neighboring town of Coventry probably died there as well. A lawyer would likely have starved in such eighteenth century rural communities. It is quite possible that the John Andrews (c1716-1803) buried in Providence is the same John Andrews (1724-1805) that married Abigail Whipple. Unfortunately for us, the Andrews line can be traced back to the fifteenth century, at least, and John Andrews is a common name, with many John Andrews existing in the New England area in 1772. But while we may never know exactly which John Andrews is our suspect, it is most likely one from Providence. Sidebar: Note that the Gaspee Days Committee uses the character of John Andrews, Esq., Judge of the Vice Admiralty Court in a highly fictionalized way. 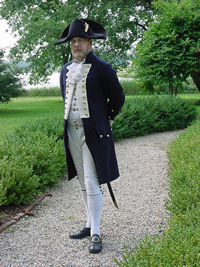 John Currier of the Pawtuxet Rangers has for several past years worn a Royal Navy admiral's coat and hat to portray a rather condescending and haughty characterization of John Andrews each year as we perform mock 'indictments' for treason against King George III. These indictments upon various descendants of those that burned the Gaspee in 1772 are given annually at the Rhode Island State House in May during the Official State Proclamation of Gaspee Days. This characterization is for convenience only, is historically false, and we apologize to any offended descendants of this man. While John Andrews was, indeed, a Judge of the Vice Admiralty Court, he was not an Admiral in the Royal Navy, he was almost certainly a Whig rather than a Tory, and he obviously gave false testimony to the Royally appointed Commission of Inquiry at Newport. Our annual indictments therefore carry an additional wink to the reality that the court system in all of New England was highly favorable to the Colonists. Above Right: John Currier, RIM, portrays John Andrews, Esq., Judge of the Vice Admiralty Court each May, and portrays Lt. William Dudingston, Captain of the HMS Gaspee, each June. We present John Andrews as an unindicted co-conspiritor in the Gaspee Affair, guilty of perjury and obstruction of justice at the very least. In doing this, we acknowledge him as a patriot to the cause of American independence.